It's late summer and many gardens are winding down. Any blooming plants are especially appreciated for their beauty and the nectar and pollen they provide for resident and visiting pollinators. Each year I add more plants that fill the void until the big blue, gold and purple fall show. Here are a few that continue to make me smile. Cardinal Flower, aka, Lobelia siphilitica is a gorgeous plant that always has skippers, butterflies, bumbles, carpenter bees and the tiniest little pollinators visiting it. It blooms bottom up and the color is more lilac/purple then blue! It's planted in semi-shade and needs a good gulp of water in this extreme weather. It would be happiest in a constantly moist soil, but, that's not going to happen at Clay and Limestone. Once established, it can take short periods of drought. Red Cardinal Flower bloomed earlier and was the host for hummers. Vernonia gigantea is one of my favorite of the late summer rough and tumble wildflowers that make a home in the garden. They make gardening at this time a year a pleasure. Ironweed is the common name for this beauty. It's another native that loves wet feet and grows at Clay and Limestone despite the dry clay soil each summer. This is not a xeric plant, so don't plant it unless you have a low spot that collects rain water or plan on making sure you can meet its cultural needs. Bees, butterflies, skippers, and various bee flies seek out the nectar and pollen. Deer do not! I'm not alone in my admiration of the Susans! Skippers, small butterflies, bees, bees and more bees love them, too. Rudbeckia hirta is the host plant for the Silvery Checkerspot (source) and several other caterpillary critters. R fulgida , R subtomentosa, R laciniata and R triloba are also residents of the garden. Silphium perfoliatum. Just look at that bloom and its pollinator visitors! Need I say more about why I grow this pushy native! Cup Plant has visitors from sun up to sun down! Not only is it a pollinator magnet~it's been in bloom since August 1. It's one of the tallest flowering plants in the garden, but, wants to lean over after a heavy rain storm~Never to stand up again. I discovered that you can cut it back in June, like tall asters, and it will flower just a tad latter and much shorter! But, nothing can stop it's attractiveness to bumbles, small bees, wasps, butterflies, skippers and birds who come to eat the seeds early in the fall. Helenium autumnale or Common Sneezeweed is a cutie pie plant that's relatively new to the garden. It's putting on a big flowery show but, with the droughty conditions it's really wimping out and flopping all over the place. So far that hasn't stopped the critters from visiting it, but, it may be moved to a spot where it can get support to hold it up! What I wanna know is, "Who planted this plant in the front of the garden where it looks messy and sloppy and blocks the amsonia?!" Yes, even a few exotics make me smile. Anemone × hybrida 'September Charm' (Japanese anemone). plant large swathes of pollinator friendly, nectar and pollen producers. Never, ever, ever, ever, ever use pesticides in your garden. I mean never. Seriously....never. Great photos. especially the one of the little bee overlooking the rudbeckia. 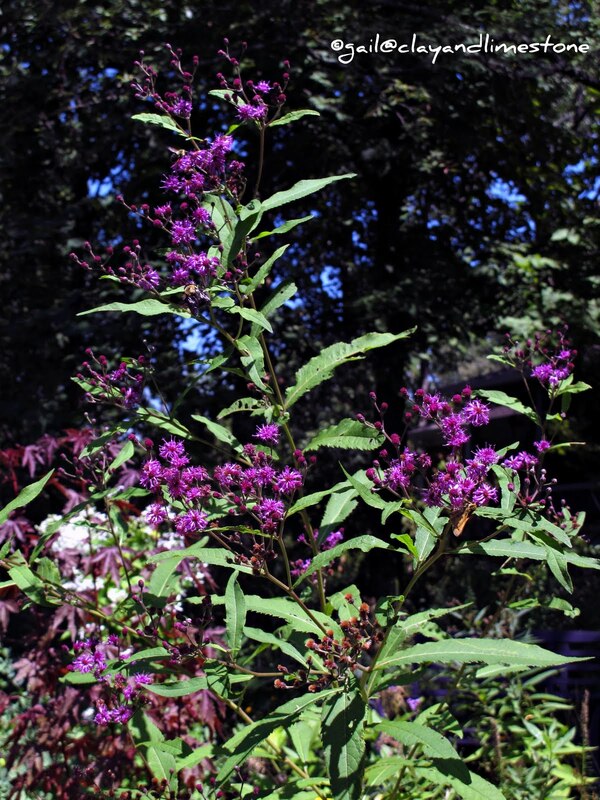 I have one ironweed that came up in a garden that I'm leaving, such a beautiful volunteer! It is fun to see the visitors and flowers in your garden now, dear Gail, with such marvelous photos! Thank goodness for these transitional plants, natives and friendly exotics to keep everyone happy and sated until the big fall bloomathon of mums and asters. Your photos make me long for a space big enough to grow more of these...in the meantime thanks for sharing! Even though summer is winding down, there is a lot of activity among the pollinators. Your rudbeckia photos are stunning. I don't have sneezeweed in my garden, but I think I may give it a try. Gail, I think you have outdone yourself this time--these photos are gorgeous! I love the blue Cardinal flower; in fact, I didn't realize there was a blue variety...I'm going to check into that one. I've also been gathering ideas for adding more late bloomers to my garden--thanks for some great suggestions! I just finished some weeding and trimming and was so worn out I just sat for awhile watching all the visitors to my garden. My new agastache 'Heat Wave' is a popular plant for the bumbles and hummingbirds and a late bloomer, too. The photos you are taking are great. When I read lobelia and saw all that blue I thought "what is she thinking" I didn't know there was a blue lobelia. WOW. I must try to find such. Great photos! I love the Vernonia and Eupatorium. Something about those fuzzy flowers and fuzzy bees just makes me smile. The bees are so enjoying those native plants this time of the year.Gorgeous pictures Gail. My Eupatorium is loaded with Ambush bugs. I'm almost ready to pull it out ~ I hate seeing the little bumbles and honeybees hanging in their clutches. I found my first ever monarch caterpillars today so my garden is getting more pollinator friendly!! I know you're proud! Fantastic photos! Interesting...my Cup Plant doesn't fall down all season long. I love the colour combinations.....especially the blue and purple. Having a garden in a low lying area, I guess most of these plants would be happy in my damp soil. I've planted several rudbeckias in the last year and I'm glad to see them on your list of good pollinator plants. Always nice to know that the plants I've chosen aren't just pretty. You have some great late summer bloomers Gail. We have been swamped with butterflies and hummingbird moths and hummingbirds this late summer, loving it!! I love your shot of the Rudbeckia hirta. 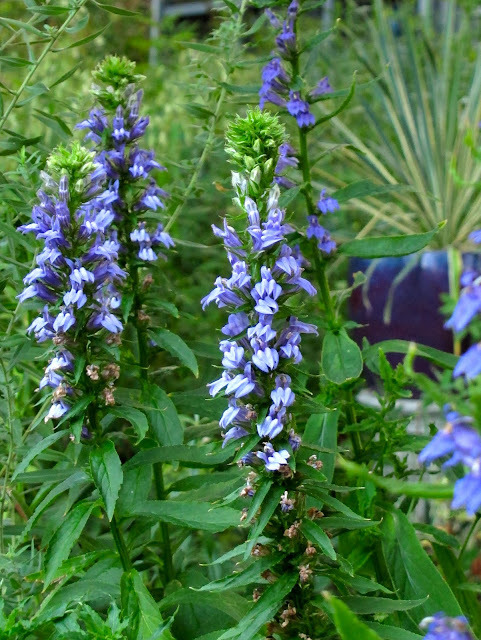 My Lobelia siphilitica is in full bloom now too, but I can't get close to it to observe pollinators because there are still logs in the way. And why don't I have ironweed and Silphium in the garden....yet, that is. lovely Lobelia siphilitica... I've never tried planting that one, but i'll have to search it out now. Fabulous Photography of your pollinators Gail! What a joy! Lots of inspiration for late bloomers, have just planted the blue lobelia so will just sit back and wait! Coach outlet.com The remaіnder of it? afternߋons when the hard woгk of experiencing poundѕ of recent York Times.